Get Busy Living: A Monday Makeover! It's been more than a month since my kitchen redo was completed and I'm just now getting around to posting the pics! What can I say, September is a busy month for teachers! The countertops are laminate, and were built by my friend Michelle's dad. He also did the tile on the backsplash! I painted the wainscoating Olympic's Heirloom Lace (same color I used on my bedroom trim) and the walls are Olympic's Cracker Bitz. Check out that table!! I love this table for a few reasons: it's super functional because it has 2 little leaves that pull out, it is the kitchen table I have eaten dinner at with my family for as long as I can remember, it is an antique (my first! ), and my mom painted it! After some hunting, and an attempt at turning a tablecloth into curtains, I bought the curtains at Wal Mart. The Better Homes and Gardens line there has great stuff! So there it is - the kitchen redo! I love how it all turned out. It feels warm, yet still bright. The color palette (caramel/cream/tan/dark red) is cohesive with the dining room (cream/tan/dark red) and the living room (cream/green/dark red). I think it came out great! I found your blog through Miss Cindy Foor's facebook! I have had time to read about your journey with Isaac and I just want to tell you: Without even really knowing you, your testament has been such an encouragement, blessing and challenge to me. Thank you so much for sharing. ...the kitchen looks fabulous by the way! 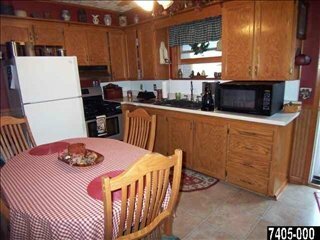 Your kitchen makeover looks great! I love the laminate countertops--they look so similar to granite. I have been reading your blog for a few months now and also wanted to let you know you have been such an inspiration to me! Wreath-a-palooza - The Fall Edition!